I was looking through Face Book the other night whilst away on business and saw a wonderful painted model which really caught my eye. It was of the very famous Chasseur a Cheval Officer of the Imperial Guard looking back on his steed whilst brandishing his sabre. An evocative and truly inspiring piece of art. 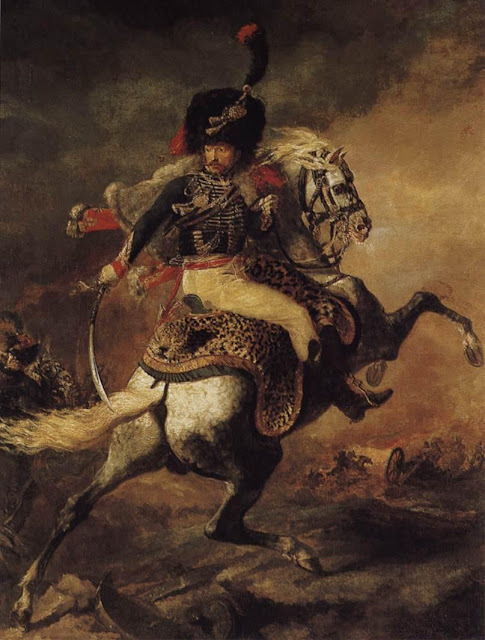 The artwork of course is by Theodore Gericault "Officier de chasseurs à cheval de la garde impériale chargeant", which translates into "Officer of the Chasseurs à Cheval of the Imperial Guard charging". It is incredibly famous as I have said and first exhibited in Paris in that infamous year - 1812! The work itself - truly delightful! Wargames Foundry produced their version of the figure many years ago sculpted by the mega talented Perry brothers whilst still doing work for them. As I looked at the FB post I remembered I had the very same model and decided that I would do my best to get it complete and turn it into another highly volatile and flamboyant French Aide De Camp for General D'Armee. almost 32 years ago! Bloody hell that's a long time. I still need to finish a few bits and pieces, varnish and of course hide the metal supports for the front legs however I am very happy how its turned out so far. my erstwhile opponent Cookie looks on at the field whilst I admire my Gericault! Thanks Phil. It’s really such a wonderful model to paint and an inspirational painting that it’s based upon. Very good Mark as I would be very keen to see it as well as I never knew their was a plastic version. That’s pretty impressive Mark, firstly that you have the patience and skill to do that and secondly that you still have he figures. Very nostalgic! A wonderful adjutant, Carlo! I liked it very much! Cheers Serguiss. I do like this model as an ADC very much. A lovely post Carlo. Thank you for the reminder. Far from a proper print of this I had a page torn from a magazine as my childhood "poster", constantly striving to emulate Gericault and never will!. Thanks Chris. It is a wonderful painting and the Perry lads did it justice in the truest sense. It is an excellent model and you've made a cracking job of it. Why thank you very much Paul as your kind comments are greatly appreciated. It’s great when a particular figure really speaks to you. 😀. Came out looking great. That is so true Stew. Often we can almost labour through painting figures however this one was an absolute delight. Absolutely true Kerry as they are always so colourful. I love the figure and the painting both, Carlo, and even more so the fine job you've done painting it. Thanks once again Peter for your always positive and encouraging comments. It is a cracking figure.